In this small popular Pasco County, Lutz neighborhood of Woodridge a Classy Classic, Custom designed, 3 Bedroom, 2 Bath, open, split bedroom plan home sits on a large corner lot w/side-load 3 car garage.Lovingly cared for, one owner home, under an Oak canopy, on a park-like lot w/wonderful landscape. Enter through lovely leaded glass front door & feel the spaciousness of 9 ft ceilings, 8 ft doors, hardwood floors & elegance of crown molding in the huge LR. Formal DR w/painted wood molding all around has California Shutters, Crown molding & chandelier. Thru the LR step into the lg Florida room w/tile floors, windows all around to take in the park-like view & hurricane proof, security, exit door w/3 way locks. Fr. doors to the breakfast nook w/chair rail adjoining the lg kitchen w/Granite, tile floors, 2 pantries & all appliances incl. Convenient, very lg laundry room has storage shelves & cabinets. All bedrooms are over-sized. The roomy Master Suite w/2 walk-in closets features a lg bedroom & very lg master bath w/tile floors, 2 vanities, lots of mirrors, water closet, soaking tub & step in shower. New water heater & new water softener, Roof-2012, a/c-2014. 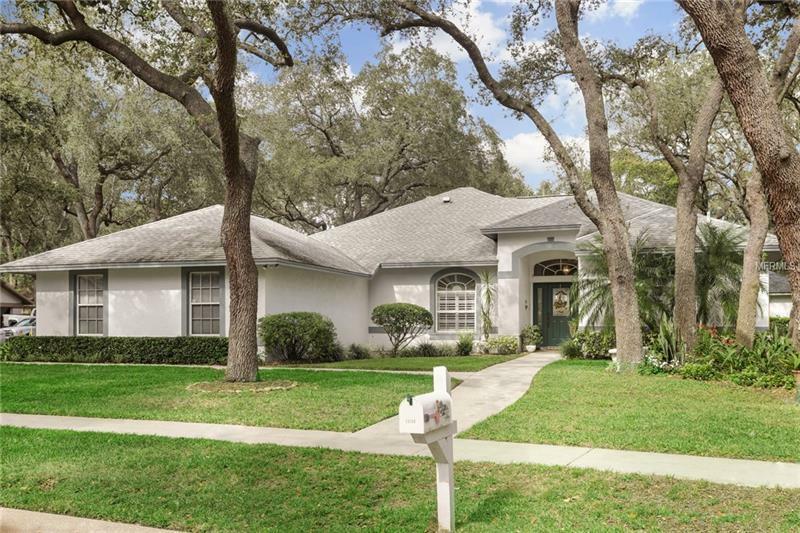 Woodridge is a small, quiet, amazing community w/Grandfather Oaks throughout, sidewalks & friendly neighbors just barely inside Pasco Co, between SR54 & County Line Rd for easy access to Tampa, New Tampa, Wesley Chapel, I-75, I-275, US41, Suncoast & The Tampa Outlets, HOA $175/year! Low Pasco County taxes & great new schools. Hurry to see this one!